This post was brought to you by Swagbucks, however all opinions are my own. When I first started making money from home Swagbucks was my main source of income. I really enjoyed it because I felt in control of what I was doing and I got pretty darn good at earning a good amount of points (called SB) everyday. In under an hour per day I was earning $50+ in gift cards every month that could be used to buy diapers, birthday gifts, etc. for my family. If you aren’t familiar with Swagbucks they are a website where you can earn SB by doing simple tasks such as watching videos, searching the internet and playing games. Once you’ve accumulated enough SBs then you can redeem them for gift cards to places like Wal-Mart, Target, Amazon or Pay Pal. It really is a great way to earn extra money each month. Today I’m going to show you how to earn 60+ SBs in only 30 minutes. To do this you will need two or more devices such as a computer, smart phone or tablet. You will also need to have a Swagbucks account and download the SBTV and EntertaiNow apps to your smart phone and/or tablet. Step 1: On your computer, complete the Daily Poll on the sidebar to earn 1 SB. Step 3: On your computer, complete the Daily Crave Activity on the sidebar to earn 1 SB. Step 4: On your smart phone or tablet, open the SBTV app and start streaming videos to earn SBs. (Tip: You will have to watch an ad before each video, but once you’ve watched a few seconds of the video you can click done to skip through to the next ad.) Repeat this process until you’ve reached your daily earning limit for the SBTV app. Once your daily limit on SBTV is reached you can move on to watching videos on EntertaiNow to earn even more SBs. If you have a smart phone and a tablet you can open an app on each device and stream video at the same time to earn even more SBs. Step 5: While you are streaming videos on your smart phone or tablet you can also complete activities on your computer to earn SBs simultaneously. The easiest way that I’ve found to do this is to either click “Watch” on the sidebar to watch videos OR find the “nGage” offer on your home screen and watch videos that way. Once you’ve watched a certain amount of each video you are able to click-through to the next video. BONUS TIPS: Check your SB inbox each day for easy offers. Also, perform searches each day for a chance to earn extra SBs. Lastly, check your homepage for easy offers such as taking a quiz, watching a movie trailer or engaging with an ad to earn even more SBs. By completing these steps on a daily basis I am able to earn anywhere from 60-140+ SBs in a minimal amount of time. You can even start videos on your device and leave them running while you do other things if you’d rather, but it will take longer to earn that way. If you really want to amp up your earnings then consider downloading the new SwagButton for Chrome, Firefox and Internet Explorer. The Swagbutton helps you earn SBs no matter where you are on the web. It also gives you automatic cash back reminders when you visit over 1,000 different online retailers. Members who download and utilize the SwagButton earned 3x more than members who don’t. How cool is that? 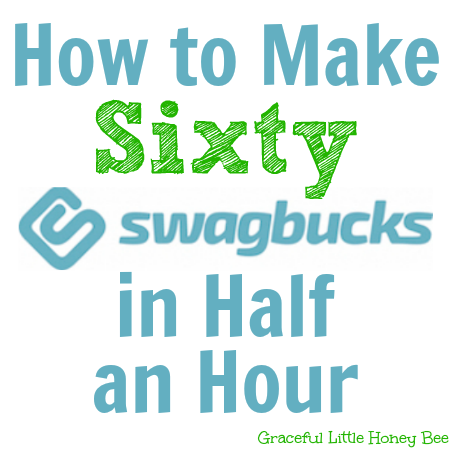 Swagbucks is an easy way to earn extra money that anyone with internet access can do each day. Be sure to visit Swagbucks to set up your own account so you can start earning too! What’s your favorite way to earn SBs?? I’d love to know! I hope you found my tips helpful Missy!